It’s hard to go past a perfect Napoli-style pizza for a casual dinner. Throw in a salad or two and a few Peronis or an inexpensive bottle of Chianti and we’re talking a perfect night out. For years I relegated pizza to one of those food types that is best left to the professionals. After many dismal attempts at home-pizza making, I had concluded that unless one invested in a fancy wood-fired oven, pizza at home was always going to be a disappointment. Last year, when I started spending more time in the country at my Irishman’s place, we were missing our favourite Sydney pizzeria. And since there just wasn’t a local alternative, we decided to see if we could find a way to make decent pizza at home. Over many a Friday night pizza session we had some wins and some dismal failures. The good news is, with a little help from Jamie O, we managed to find pizza nirvana at home. With just a regular fan-forced electric oven, a $15 pizza stone and some creativity, pizza night in the country is now something to get excited about. With something as simple as pizza, your flour can really make a difference to the flavour and texture. Try to seek out some unbleached, stone-ground bread making flour if you can. Kneading can be a pain, so I used to really skimp on this hands-on step. Then one day I made my dough and realised after I had kneaded it that I’d forgotten to add the yeast. Rather than throw it out and start again, I made a hole in the middle of my dough and kneaded it for ages to makes sure it was well distributed. And the result? The lightest, loveliest pizza base ever. Since then I’ve made the extra effort to knead for at least 5 minutes but sometimes I can get in a rythmn and have a little ‘pizza meditation’ session for 10 minutes. Happy Jules. Happy pizza. After watching Heston Blumenthal visit a pizzeria in Naples to learn the secrets to pizza perfection, there’s no doubt that a super hot oven is half the battle. From memory the wood fired ovens were around 500C, far hotter than a standard home oven is capable of. After experimenting with different oven positions and different surfaces to bake the pizza on, we’ve concluded (very scientifically, that the best way to get as much heat as possible into your dough (and therefore get the best pizza possible) is to place a pizza stone on the floor of the oven and allow it to preheat on the highest setting for at least 30 minutes. This way the heat from the bottom element in the oven is directly transferred to the pizza stone. Simple and effective. My favourite Sydney pizzeria is accredited by the Vera Pizza organisation from Naples and one of the things I love is the simplicity of their toppings. It can be easy to try too many different elements and add too much of them. Less is more applies to pizza too. 1. 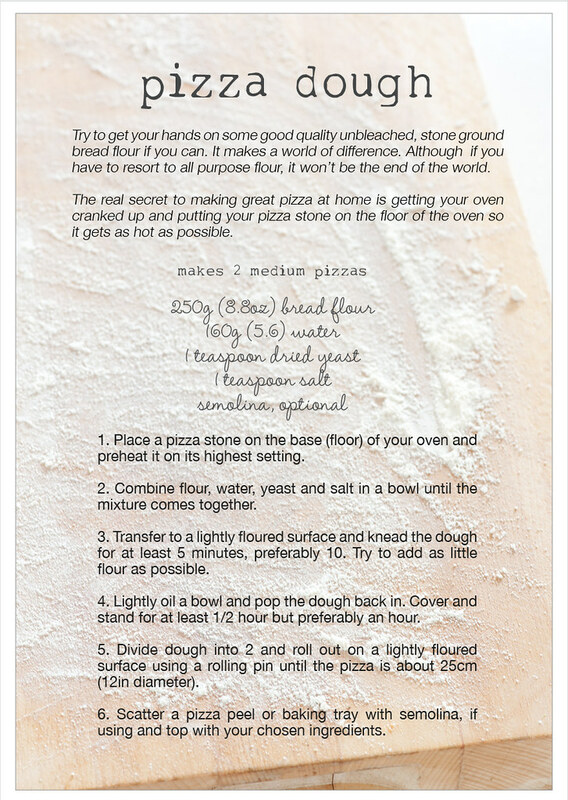 Prepare oven and dough as per pizza base recipe. 2. Tear ricotta into chunks and scatter over the base. 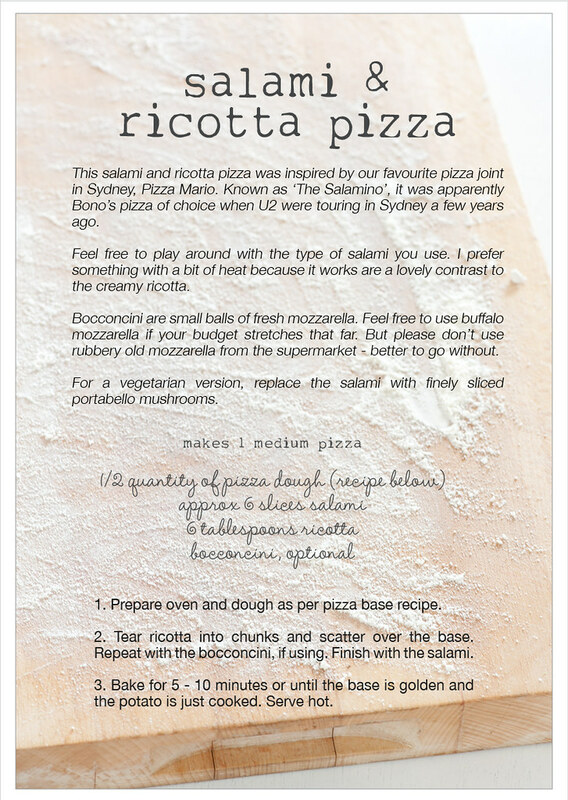 Repeat with the bocconcini, if using. Finish with the salami. 3. Bake for 5 – 10 minutes or until the base is golden and the potato is just cooked. Serve hot. 2. Toss potato slices in a few tablespoons of olive oil with rosemary and chilli, if using. Season generously. 3. 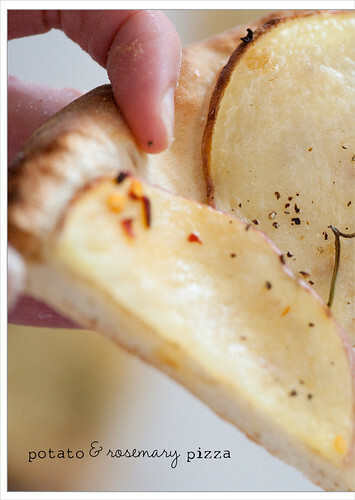 Arrange potato slices over pizza base. Top with cheese, if using. 4. Bake for 5 – 10 minutes or until the base is golden and the potato is just cooked. Serve hot. 1. Place a pizza stone on the base (floor) of your oven and preheat it on its highest setting. 2. Combine flour, water, yeast and salt in a bowl until the mixture comes together. 3. Transfer to a lightly floured surface and knead the dough for at least 5 minutes, preferably 10. Try to add as little flour as possible. 4. Lightly oil a bowl and pop the dough back in. Cover and stand for at least 1/2 hour but preferably an hour. 5. Divide dough into 2 and roll out on a lightly floured surface using a rolling pin until the pizza is about 25cm (12in diameter). 6. Scatter a pizza peel or baking tray with semolina, if using and top with your chosen ingredients. While pizza has now been relegated to a cheat day (or weekend), my current favourite topping is caramlised leek, pancetta and mascapone. The mix of sweet, salty and creamy is a perfect match made in pizza heaven. My pizza routine involves using the grill and the back of a cast iron pan (because I’m cheap). First I whack on the grill to full for about 20 minutes and heat up the pan on the stove for a bit as well. Then I flip the pan over, lay my dough and toppings over and pop it under the grill. It only takes a few minutes before it’s all nice and puffy. Works a treat. On another note, who knew there was an organization that “accredited” pizza parlors? I’ll have to see if anyone around here has their “Seal of Approval”. Yummmmm I’m drooling. I’m lucky enough to have a wood-fired oven, will be giving these a go for sure ! Pizza has become a once-a-weekend staple at our place. After finally finding a favorite almost no fail base recipe, anything can go on top! I will hceck my flour to water ratio to see if your pizza base comes out as ‘wet’ as mine. Toppings: Hummus and potato are a favorite, so are goat cheese and smoked salmon, or creme fraiche and porcini. Yum. The simpler the better. I’ve also noticed that I have less trouble with the base getting soggy patches and needing longer in the oven if I put the toppings on just before I put pizza in the oven. I do use a pizza stone, and on the days when I am being too lazy to pull the stone out from under the other pots and pans, I do crank up the heat all the way (instead of using the stone) and still get a thin and crispy base with fluffy bread. Pizza without cheese also shifts pizza into the perfect food – very low in fat and salt. You have full control over the toppings…. 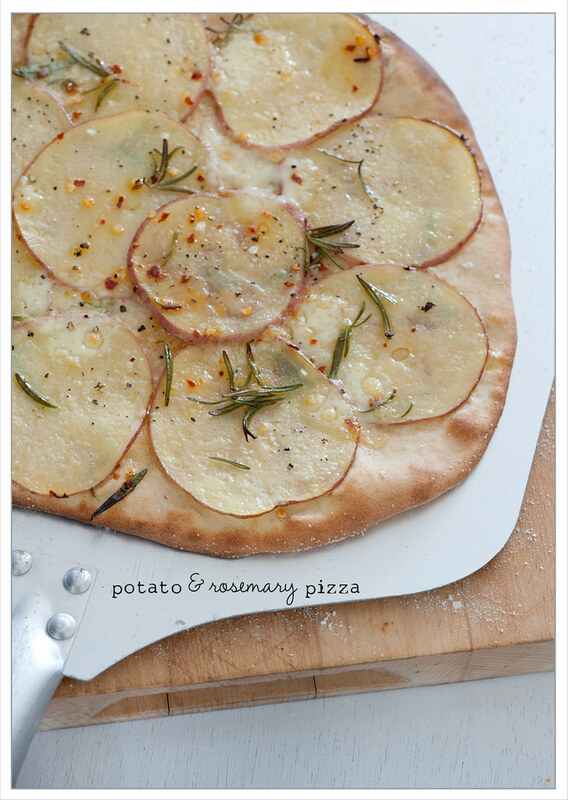 The potato and rosemary pizza looks amazing! Never tried doing pizza at home, but would love to! Hi Jules, what a beautiful blog! Great pictures and great method – the 5 ingredient method! I make a good pizza which I attribute to my pizza stone. However I have never used it on the floor of the oven. Looking forward to trying it that way. Nom, potato and herb pizzas are so under rated. So are simple, minimal toppings, as you mention. Yes! I should have mentioned that pizza is now a cheat-day feature – we had pizza for lunch last saturday. 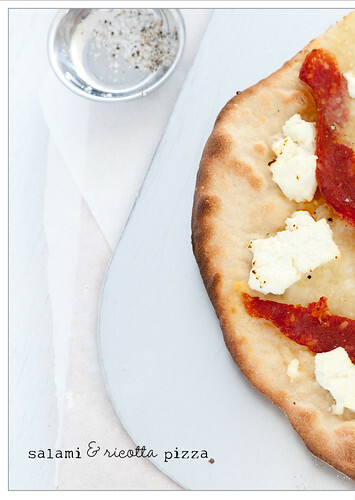 Would never have though of adding hummus to pizza – but it makes perfect sense! Apparently the Napolese (Napolitans?) take their pizza very seriously and there are lots of rules.. but I have a lot of respect for the pizza purists. I know this is totally off topic but I love the font on the label of the bread canister! Do you mind me asking what font this is? 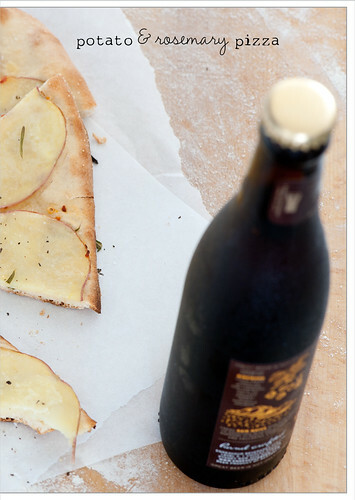 if you have the chance you should try making a gorgonzola and pear pizza, it’s delicious! it’s travelling typewriter font. thanks for asking! love the sound of pear & gorgonzola! looks great. 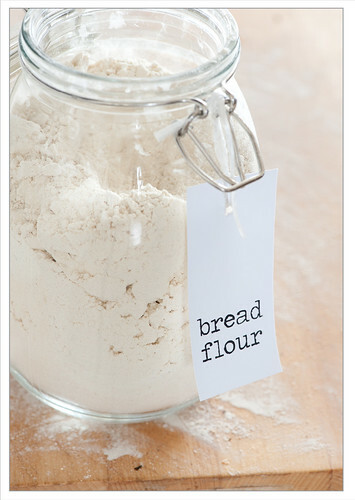 that is a great idea for storing bread flour. i use too much to have it in a small container. All these pizzas look fantastic! I have a pizza stone but clearly I was not getting it hot enough. I have been in a pizza mood lately and the pizza stone is my friend – I put it on the shelf where the pizza will be and place the tray directly onto the stone – because I got sick of pizzas that werent’ crisp on the bottom. Jules – Pizza Mario is my favourite pizza joint too! I miss it so much since leaving Sydney. If you’re saying that these home-made beauties are a good substitute then I had better get my apron on and make some! We just had your pizza for dinner. One side of the baking tray was topped with your potato and rosemary recipe. I added some freshly grated Parmesan cheese. It was delicious. Again, Jules, many thanks for your generosity! To the other half of the tray I added what was available in the kitchen: thinly sliced zucchini, lemon thyme and buffalo mozzarella. Wonderful! Highly recommendable. lovely to hear from you! and thanks for being a vote for maximilist toppings… each to their own. 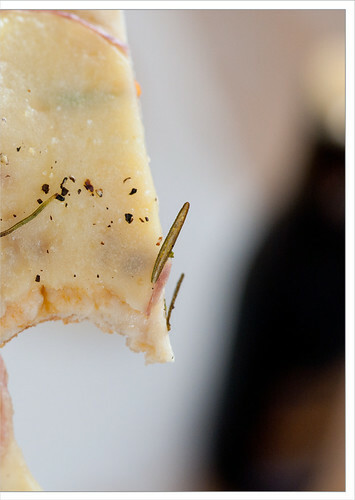 loving the sound of your zucchini pizza – actually having a why didn’t I think of that moment… have zucchini & lemon thyme in the garden… just need to find me a buffalo! Oh my! These all sound amazing!! I must make… soon!! I’ve done a pizza with potato before and it was pretty darn good. 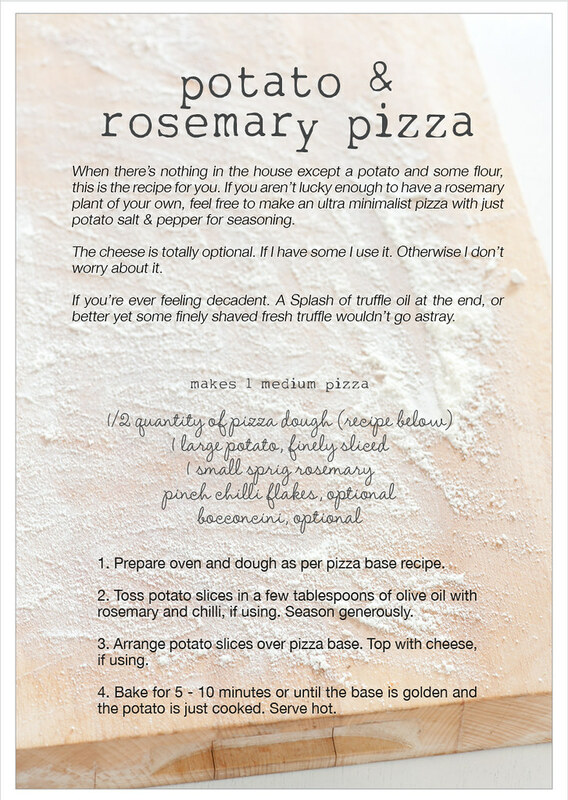 Hi Jules, your recipe gave me the inspiration to try my own “potato pizza” – I needed it to be low in histamine, so I had to modify your original recipe quite a lot, especially the pizza dough. Still, I used the idea of potato as topping and I love that this is so simple yet delicious. I use the basic boule or olive oil dough from Artisan Bread in 5 Minutes a day, but with half whole wheat flour, as my crust. No kneading required and you can keep it on hand in the fridge. It makes a quick pizza even quicker to put together. I recently learned about your blog and have very much enjoyed reading it. I recently tried the pizza recipe and, perhaps like some others reading, decided to make do without a pizza stone. Instead, I heated a cast-iron skillet in the oven (I popped the skillet in the oven when I started to heat the oven and, twenty minutes later, it was certainly very hot!) I sprinkled cornmeal in the interior of the cast-iron and baked it in, not on, the cast-iron. My pizza dough turned into what I wanted: crisp exterior and fluffy interior. I’m thinking a deep-dish would be a fun experiment. I look forward to reading future posts. Thank you. 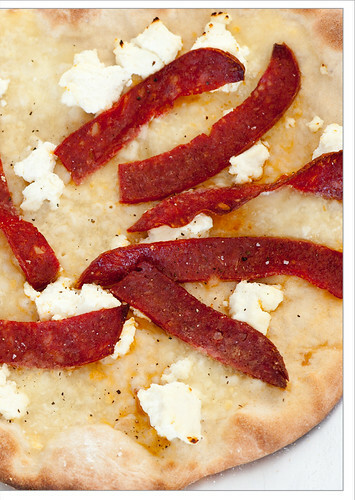 Jules, thanks for these pizza topping ideas! I had a pizza party last night and made both of them, along with a bacon-mushroom-artichoke, corn-green chili-zucchini, sausage-roasted red bell pepper, and classic pepperoni. 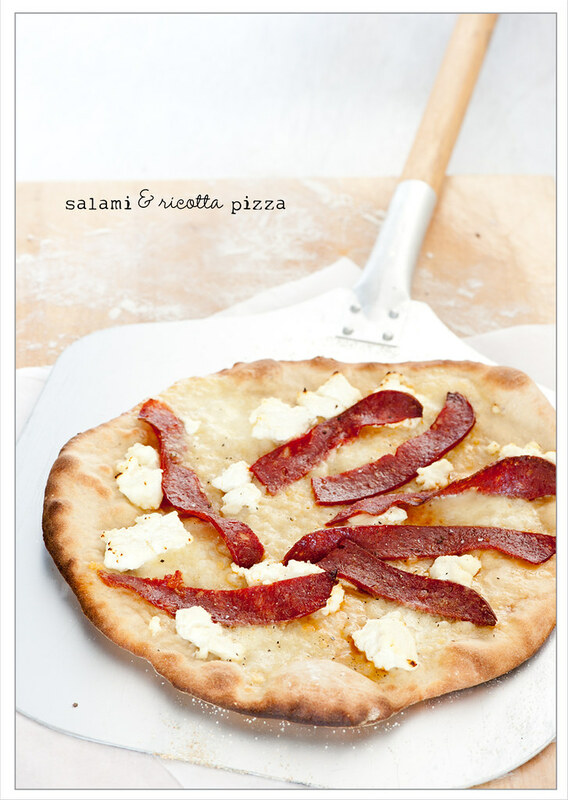 I used Peter Reinhart’s ‘Neo-Neopolitan’ dough and tomato sauce from “Artisan Breads Every Day”. It was all fantastic! 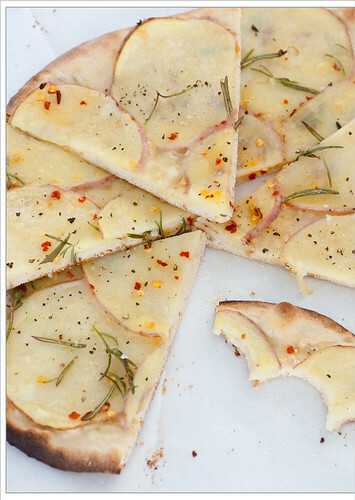 Your tips for pizza perfection are really very helpful. All the pictures are mouth watering. Thanks for sharing tips and beautiful video. 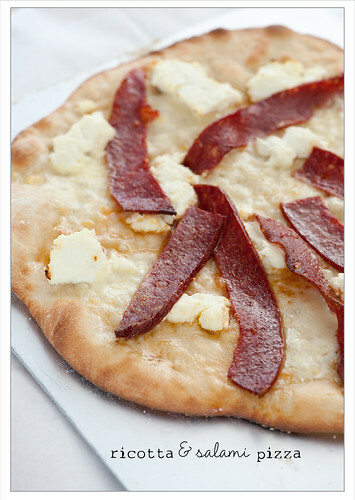 Possibly dumb questions… but firstly, can pizza dough be frozen? And secondly, do you have a brand recommendation for flour? No such thing as dumb questions Emily! Yes it can be frozen.. you can either roll it out so you can just top and bake. or just freeze in balls ready to defrost and go. I’ve been using an organic unbleached spelt flour from Demeter Farm Mills. Pretty much anything unbleached is a good place to start and if you can afford organic go for it! I’m a huge pizza fan and have taken to experimenting at home. My own tips are to mix the dough and then knead it only enough to bring it all together and then leave it alone for a good few hours. When you return, you’ll find a dough that has risen and developed in flavour. I then tip out on to a floured surface and shape into a ball, flatten, and then leave it again, because by this point it will be quite elastic. You can now crank up your oven to its top temperature. After around half an hour I roll out the dough – nice and thin- and place it onto some baking paper and leave it for a few more minutes, so it starts to rise again. Then I’ll prick the dough with a fork and holding the edges of the paper, I transfer the base to a hot baking sheet and bake for around 6 minutes. Then I add my toppings, and bake for around 6 more minutes. This method produces a crisp base with lots of air pockets, and has a slight amount of chew to it. As for my toppings, I like to keep it simple and use passata, with some chopped tin tomatoes – just a couple of tablespoons – and some good mozzerella. I also like to balance out the acidity in the tomato by add a tiny amount of sugar; if you haven’t tried it, it does make a real difference. I sometimes add caramelized onions and/sun blush tomatoes, but always in quite sparing amounts. Anyway, that’s my pizza, and for my money does a fairly good job of aping the wood-fired versions you get in those increasingly expensive pizza joints. Another option is Italcrust. Its basically a real wood fired Italian pizza without toppings. Its just preserved with extra virgin olive oil and you can make the same pizzas, skip the dough making and get the same result.